Do you think this promotional 4.25 x 3.5 in one team Edmonton Team hockey schedule right facing helmet shape dental care magnet 20 MIL is going to be good for your dental clinic? First thing is this magnet steals attention with its unique shape and helps to strike rapport with your young customers. It is retained as a matter of pride and a refrigerator art, which means your business information, is going to remain before customers at all times. 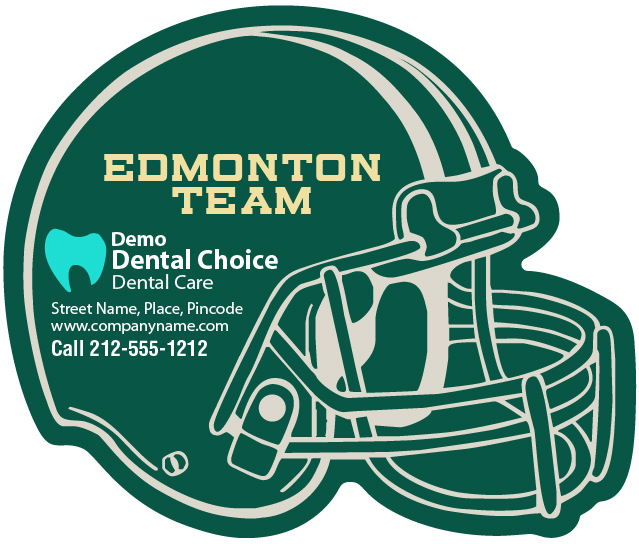 Request a quote to know about discounts and other value benefits that you can expect by ordering this customized 4.25 x 3.5 inch one team Edmonton Team hockey right facing helmet shape dental care magnet – 20 MIL.